Studied: 2001-2003: Animation and Illustration James Watt College. 1982-1986: Print Design and Illustration, Glasgow college of Building and Printing. You cannot help look at a drawing by Paul Cadden and not been amazed by the sheer talent and detail that goes into his work. They are incredible, intricate and highly accurate renditions of people and places. Within his work Cadden strives to ‘intensify the normal’ and create scenes and portraits that have an emotional and social effect on the viewer. His drawings look effortless. But they take time, careful planning and an observant eye to be so accurate and yet look that effortless. 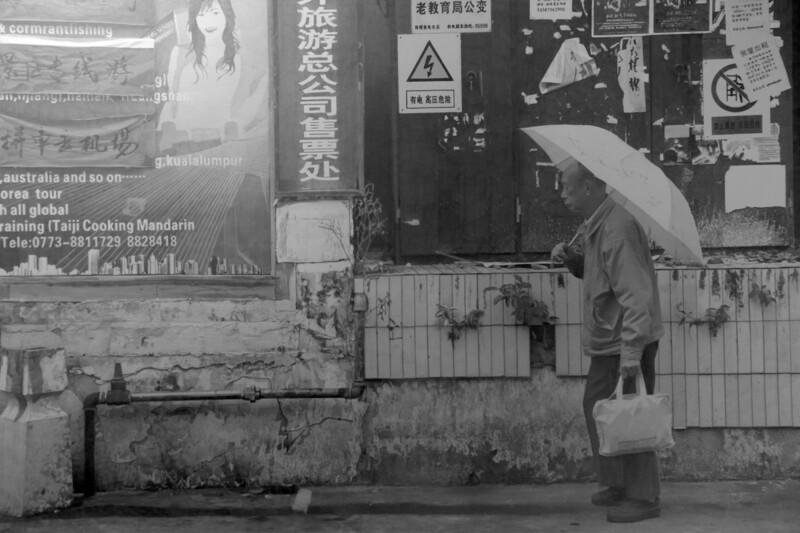 Paul Cadden maintains that hyper-realism is about more than representing reality in a new medium. It is, instead, about creating the illusion of a new reality - one that merges a believable, life-like appearance with emotional, social, cultural, and political themes. 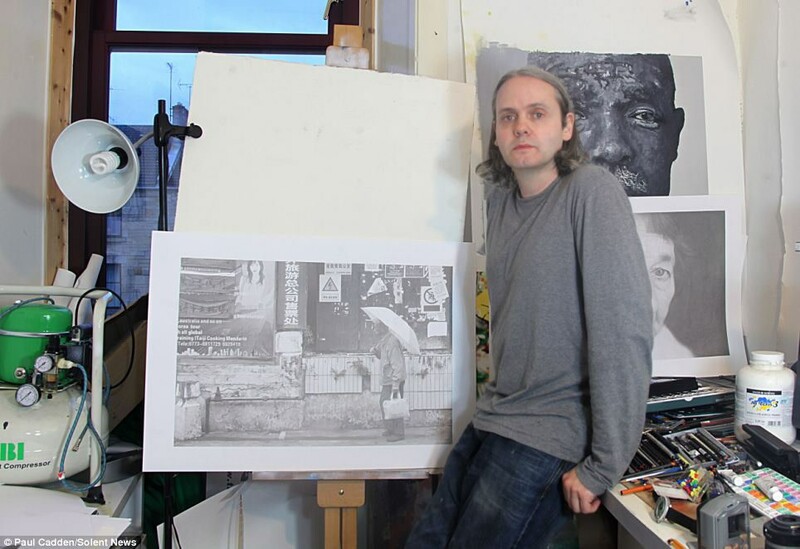 Cadden’s work has received worldwide attention and has been featured in national newspapers and tv programmes. He is also part of private, coporate and museum collection worldwide. Reference material is a big factor when working from photos I have taken or stock footage, which is then manipulated in Photoshop to enhance detail or add certain elements occasionally adding CG renders. I then use the grid method to transfer the design to the canvas. As the picture progresses, I refer to the source material less and less, and the drawing takes on a life of its own. The connection between the artist and the viewer. Hopefully, the viewer's interpretation connects with the artist's technical emotional or aesthetic value. hence the idea of Intensifying the normal. Has your worked changed since your early days? How has your work evolved? exploring the use of fluid dynamics and photorealistic CG for reference material. The digital camera brought many changes and opportunities in the way hyper-realists artists work, as technology keeps evolving do you see any new “tool” making such an impact as the digital camera had? I think Virtual Reality devices may affect how people experience art - VR Art Galleries for example. The Royal Academy's Virtually Real Exhibition was a huge success. Another piece of technology which would be interesting to see how it could be used is Google's Tilt Brush which allows you to paint in 3D space with VR. I don't really have a favourite artist but If I had to choose it would probably be Austin Osman Spare whose art I have collected since I was a teenager. He was someone who managed to become famous and forgotten at the same time. I admire his stoicism - his refusal to give in to his many setbacks when times were hard. You have recently moved to a remote island in Scotland, is that right? Is this going to affect what you draw? The most obvious effect on what I draw would be the ever changing landscapes that surrounds me. My studio is only 50 meters from the sea and overlooks a hill covered in purple heather. Last month the hill was a carpet of yellow wild flowers. Inspiration from my travels around the Scottish islands can already be seen in the drawing ‘Tangasdale Beach'. My previous Scottish Landscapes series was completely different so I’m looking forward to experimenting more with this type of landscape drawing. I will definitely have to travel if I want to do urban landscapes! Your work involves a lot of travel. Do you have your next trip planned? Tell us about the most Inspiring trip you have taken. I am hoping to take another visit to New York next year. It's a wonderful place, full of creative possibilities. The meticulous detail included in your drawings is absolutely fascinating and makes it hard to believe it was drawn. Are all these details present in your photographs? Yes, I tend to add more detail whenever possible. I have recently started to experiment with 360 degree light probes and high dynamic range lighting with CG software to mix photos and CG elements. Most of your drawings feature a prominent character, how do you choose your subjects? How do you start a drawing? I begin with as many reference photographs as possible and I sometimes mess around with sketches for smaller parts of the drawings.